New parking system a total change is necessary for a comfortable and pleasant lifestyle for Indian people. 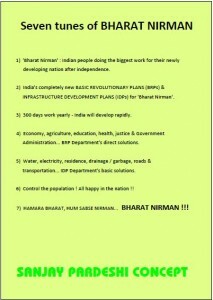 Since India is facing many problems, we have classified important problems in two distinct parts. We has arrived at a twelve point plan to tackle these problems. This program is titled as Twelve Point Plan. Keeping the above things in mind, let us also understand a few other important points. We all know that India is facing enormous problems in major areas in the form of corruption, huge economic rift in lifestyle of people, unemployment, unplanned development, poverty, suicides of farmers, and so on. Most of these problems are inter-related. These issues divide our country in two parts. 20% of people are 'INDIAN', and 80% of people are from 'BHARAT'. In India, there are 50 to 60crore people earning less than Rs. 50 per day. Most of these are struggling even to satisfy their basic needs such as food, shelter, water, electricity, education, health, justice, roads, and importantly, value-added agricultural products. We have been working on all these issues for past 10/12 years. Our main inspiration is Late Shri. 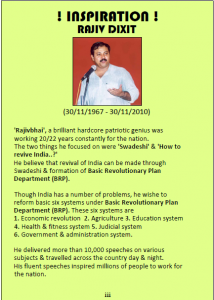 Rajiv Dixit (unfortunately, he is not with us anymore. 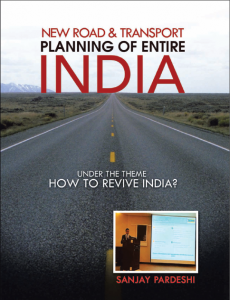 He passed away at the age of 43 due to heart failure).Our concept starts with the question – How To Revive India? Agriculture: If all farmers of India decided not to produce much agricultural products except their own needs, what will we eat? How shall we survive? We will have to purchase from other sources. But at what cost? We have to take this issue very seriously. If this happened suddenly, what will be the situation? On the other hand, farmers suicides have not stopped, for which both, we and the government, are responsible. Farmers put their funds throughout the year, work hard and the government decides profits and selling rates of the produce. Is this possible in any other industry? Except for farmers, who will run this loss making business? If no one, then what are our responsibilities? No one ever thinks of it! Now everyone shall and must think. There has to be profit ability for the farmers. For balanced, profitable and good quality agriculture, a separate action plan will be implemented from ground level to top level. B.R.P. department will prepare this complete action plan and execute it properly. A balanced, complete educational system with reasonable fees should be offered to the people. Free education for economically backward people should be made available, too. The Gurukul system that existed in India for thousands of years was replaced by the colonial government with a new 'convent' system, which still continues in India. The muted division of our people – 80% people from 'Bharat' and 20% people from 'India' – is a result of the major drawbacks in the 'convent' system adopted by us. We have to remove this disintegrated system and establish a new strong education system which will be available in all the major Indian languages. (A special point here: Oxford university of England is following 'Gurukul' education system for the last 600 years). To make every student wise and a good citizen, a totally new curriculum will be prepared by education experts. Every student can avail the entire education in his/her mother tongue. Such education will be available from 1st Std. to a Doctorate Degree, for all branches of knowledge. Students can choose alternative Hindi and English languages, too. The Percentage Method will be closed in future. Students can select any type of practical education of their choice. Educational experts and B.R.P. department will execute the new education system. Government and Administration System: Existing government system was formed mostly according to British laws and rules. This was primarily for ruling our country, encouraging slavery and exploitation. E.g. the British Queen offers some rooms in 'Buckingham Palace' on rent for the sake of the nation. At the same time we are expending millions of rupees to maintain the prestige of our president (Rashtrapati), a tradition totally unnecessary for a poor country like India. Today, the President of Turkistan lives in a small flat. He appealed to all politicians and ministers to do the same, and they agreed to it. The Turkish President has thus reduced all unnecessary expenditures. Now for the last decade Turkistan is considered a developed country in Eurasia. Even today, the President of Switzerland and many celebrities very commonly use railways and bicycles for journey. In developed countries, government security departments manufacture various consumer goods, too along with weapons and other security material. This is called modernization. On the other hand, there are 34,575 different laws, rules and regulations in our system which were formed during the colonial rule. These laws, rules and methods are totally outdated, and are causing India enormous harm. This is one of the reasons why people in India are not getting the complete benefit of our country's development, though different governments have ruled us for the last 66 years. It is our bad luck that even after 66 years of independence we are still following such outdated methods and rules that encourage huge corruption. To change this situation, all of us need to be up-to-date and should try to save each rupee of our country. All such rules, methods and laws will be amended to suit today's conditions. E.g. After 75 years of age, no one shall be allowed to work in government and private sector. He/she can only provide consultancy without remuneration / fees. At present a really old person, aged 80-85 years, can get himself elected for the post of Prime Minister / Chief Minister / President / other post more than once. How can we proclaim India to be a nation of youth? Now such things shall be put to an end. Similarly, no one shall hold the same designation more than twice. If we want clean and fast development progressing on the right track, we have to make such type of fundamental changes in this 150-year-old, corrupt pattern of the government system. For this, a new action plan will be made. This is one of the hardest tasks to be carried out by B.R.P. department. Expecting continuous discussions on these serious issues. 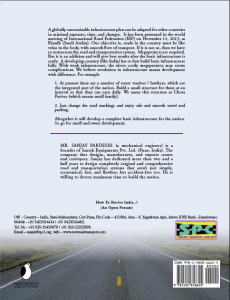 Residential Infrastructure: It is necessary to fulfill basic needs of everyone at affordable cost. Proper living place or residence is the prime one. Main issue in this is the availability of developed land. However, please note, all the efforts are worthless if population is not controlled. Our land is approx 1/3rd that of the USA, whereas the population is approximately four times. This crucial segment will require stringent government control. Generally the prices of most goods and products increase every year by 10-15%. In some case, the prices remain unchanged or even get reduced. However, the prices of land in India have increased enormously, and will continue to do so every year. Why is it happening? Rates of lands are increasing by 100%, whereas our annual development rate is 10% max. It is a very serious matter and unless we control the increasing rates of a land, owning a house will remain just a dream for the common man. Even if we save more money in actual infrastructure, it is still less than the money we may spend in acquisition of land. E.g. In big cities like Delhi / Mumbai / Pune / Chennai / Kolkata, construction cost of an average house is Rs. 1300/- to 1500/- sq. ft. In villages, it is around Rs. 1100/- sq. ft. Even if the government offers any tax-concession or the builder gives discount, the cost will be around Rs. 1000/- to 1300/- per sq. ft. in cities and Rs. 900/- to 1000/- per sq. ft in villages. It is possible to reduce cost by 10%. But what about prices of land. Due to the uncontrolled rise in the land prices, it has become a huge business for many to buy and sell land. Even the people who are working or want to work or can work in the interest of nation, all who want to contribute in social work are dealing in land because no other business can offer you such high returns in the shortest possible time. Why is this going on. Our condition will become pitiful after 50 years, if we continue to auction the land to each other. Therefore government has to control the entire situation and must change the Land Acquisition and other acts as per today's conditions. Health and Fitness System: Facilities in this action plan should be affordable to everyone, even to very poor people. B.R.P. department shall establish or launch a separate free health program for poor people, with the help of government officers / medical practitioners. India's existing judicial system is deemed to be a very critical and slow system in the world. In the business index of World Bank for 183 countries, India's rank is 132nd, even lower than the Gaza strip nation. This is a shocking truth. Because of this faulty judicial system, even after so many scams/leaders/officers/servants pay nominal fee to the court and are release on bail. The same leaders then sit in parliament, too. The worst part is that they are welcomed in their community with processions as they are"only suspects and not yet proven guilty". What a strange judicial system Neither scammed money of these people gets seized nor are they punished heavily. These people have now become our 'OWNERS'. In this peculiar judicial system, neither terrorists like 'Kasab/Afzal Guru' are hanged immediately (they were hanged in 2013), nor are scam buildings like 'Adarsh' destroyed. This is because this judicial system was established by the British to ensure that Indian people would not get justice easily. Even today, the some Indian courts are enjoying yearly summer holidays for 25-30 days. The British implemented this tradition for their own convenience. No other governmental department has this facility. Thus, even after waiting for years and spending time, money and efforts, we are unable to get justice in time. This 150-year-old obsolete and slow-moving British judicial system has to be changed. We have to introduce a new judicial system which will be uncomplicated, transparent and fast through which people will get fair decisions in lesser time. B.R.P. department will have to work deeply on such judicial system with the help of respective experts. There are many drawbacks and insecurities in today's Indian road and transportation system due to which the percentage of road accidents is on the rise. These are mostly affecting two-wheeler travelers who lose their lives on Indian roads every day. This will continue to happen in future if corrective measures are not taken. In the survey conducted by the 'National Criminal Registration Board (NCRB)', it was found that 26.5% two-wheeler travelers get killed every year in India. Similar results were also published by the 'World Health Organization' (WHO). According to the survey, India ranks first in fatal accidents. The most alarming fact noticed was that 66% of the people who lost their lives in Indian road accidents were in the age group of 18 to 50. Isn't this a dreadful situation? Therefore, to reduce these accidents, we have provided a separate lane for two-wheelers in our plan. Two-wheelers will travel through separate lanes in every part of India, i.e. villages, cities, highways, expressways. etc. Does this type of system exist in the world Hence India needs to standardize its road and transport system. In this book, we present our 'New Transport System' Security of Travelers'. Our system comprises separate lanes for two-wheelers, four-wheelers, trucks, buses, cycles, etc. There will also be standardization of buses and bus-stops to ensure safe transportation, so that passengers can travel without worry and return home safely.